These enormous devices you can see in this fisheye photo are the main parts of remote manipulator arms at the Los Alamos National Laboratory’s radiochemistry hot cell facility, where highly radioactive materials are used to produce isotopes for medical purposes. Just look at the worker below, you can see how massive those arms really are. The highly radioactive materials used to produce these critical isotopes can only be handled remotely inside hot cells, which are heavily shielded concrete containments with leaded glass windows to protect radiochemists from the radiation inside. The target was irradiated with protons at LANSCE to produce critical medical radioisotopes before being processed inside the hot cells and sent on to external customers. Isotopes produced at LANL lead to around 30,000 diagnostic procedures each month. 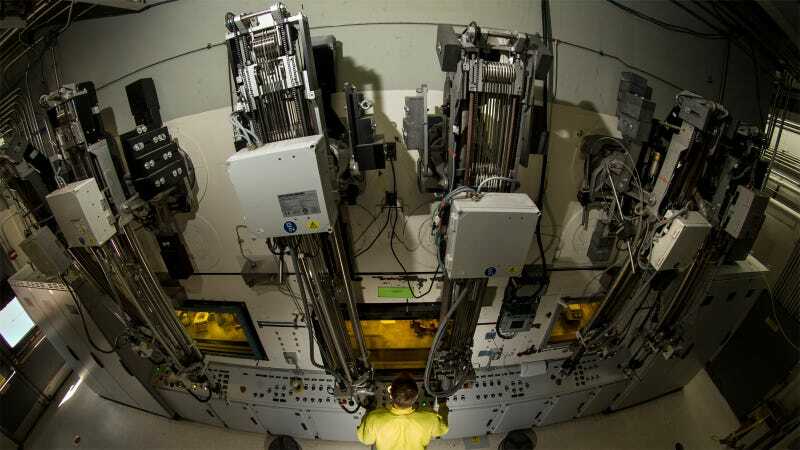 The Los Alamos National Laboratory Isotope Program produces isotopes for the diagnosis of cardiac disease, and for the calibration of PET scanners (these diagnose cancer, neurological disease, inflammatory diseases, trauma, and other circulatory diseases indirectly), and helps over one million patients every year.